The built environment is still not equated with a diverse work force unlike the stakeholders with whom we work with and for. The annual survey of women in architecture released last month, makes for uneasy reading: deep-rooted inequalities and perceptions of gender differences that seem to affect women architects particularly badly. So on international women’s day I’d briefly like to share my journey as a woman in architecture practice, research and academia. In June 2015, I was shortlisted among 11 others by the RIBA as one of its ‘Role Models’, hopefully inspiring others that they too can forge a successful career in architecture. Since I shared my story as part of the Role Model Project, I noticed a positive change within myself and how I view myself. It is hard to explain, but I am more at ease with myself and more accepting of myself. I no longer fear of speaking out about my background (read about it here) or being a woman in a still mostly male dominated profession (more about that here). On reflection, this makes sense: sharing our stories so publicly received positive responses and made me realise that I was wrong to be afraid to speak out. I no longer feel as vulnerable sharing my personal journey: I have a voice and I want to use my voice on issues that matter to me in the hope that it inspires others and to draw out the value of differences. I also realised I should no longer be embarrassed about my background, but celebrate how far I have come despite the challenges along the way and to see and use this as a strength. Much has happened since June 2015: while I am still finishing the write-up of my PhD thesis at the UCL Energy Institute, I continue to be involved with the RIBA/CIC Fluid Diversity Mentoring scheme, which has been hugely rewarding as a mentor. When I joined the University of Sheffield as a lecturer in the autumn, I also joined RIBA Role Models Professor Fionn Stevenson and Satwinder Samra. Furthermore, I have been privileged to be mentored by several colleagues in informal ways but also in a formal way with Sheffield university’s Impact Mentoring scheme, which aims to increase women representation at all levels of academia. The generosity of my mentor's time and energy has touched me and made me reflect on my own personal and professional career path and I cannot recommend enough the value of such mentee/mentoring relationships (at UCL a similar mentoring scheme is the Astrea Project). Along the way, my mentors and role models have been female but many more were male (as we are short of women to mentor): there have been many who encouraged and supported me and I cannot thank them enough for being part of my journey and helping me and many others to overcome obstacles. While they may not have been consciously aware of it, they were (and are) in fact champions of gender parity. So, on International Women’s day, my challenge goes to all of YOU: please #PledgeForParity because gender equality benefits us all. Women represent around 50% of the world’s population, and are undeniably equal stakeholders so we must make sure women voices are heard and actively encouraged. The under-representation of women (alongside the general lack of diversity) in built environment professions must be reduced, to prevent the disempowerment and alienation of a large proportion of the population and lose out on different view points: the diversity and insights offered by a more varied decision-making team can be beneficially employed to generate new ideas and innovative ways of thinking or working, providing the best solutions for everyone. I have already witnessed this in my first 6 months at the Sheffield School of Architecture, where I am part of an inclusive, supportive and diverse department, illustrating that diverse team work and ‘team-thinking’ brings the best ideas to the table and leads to innovative practices and culture changes. We need you, male (and female) built-environment professionals and academics with us to #PledgeForParity not just today, but every day. A shorter version of this blogpost first appeared on the UCL website in July 2015. You can read each of our stories which include how we overcame barriers to forge successful careers in architecture. Unfortunately at the launch event I did not have the chance to meet or speak to all the other role models – there were around 100 people in attendance. But I did manage to speak with Stephen Ware, a Part 2 architect who studied at Kent Institute of Art and Design (now University for the Creative Arts), Greenwich and Westminster Universities and who previously worked at Penoyre and Prasad, Hawkins\Brown and now at Archer Architects and who is profoundly deaf. So when I write that I spoke with him, I mean with the assistance of a BSL interpreter, and Stephen’s mum who was there as his guest. I didn't know if Stephen could lip-read or not, but I later learned from Stephen that lip-reading is almost impossible for many deaf people who have never had hearing as there are no clues to lip patterns (Stephen has not had hearing since he was about 18 months old) as also explained here. Like sign language, architecture is very much a visual language but as a hearing person, I had never given much thought about the significant barriers someone like Stephen might face – not just with what he has achieved professionally but also day-to-day barriers he encounters – though Stephen is super-organised as a result. Unsurprisingly as throughout his studies and working life, Stephen has had to pre-book interpreters (astonishingly, Stephen does not have the right to interpreters unless he is in a permanent job or is self-employed, which can be isolating). Also having to work with so many different interpreters in one year was very problematic. (Did you know that there is not sign language for all architectural jargon? So Stephen and his interpreters had to improvise and develop their own specific signs, but this did not work with continuously changing interpreters). Stephen also pointed out that the majority of buildings are unsafe for him to work alone or stay in unless they have adjusted fire alarms to give out visual warning signs. Similar safety issues apply in public toilets for example. When Stephen mentioned why all our buildings are not designed in this way I immediately agreed with him and I am baffled that we don’t do this already as it seems simple enough and would benefit everyone. This anecdote illustrates both the small changes required to make a building accessible and safe to all, while at the same time highlighting the value of diversity in architecture; indeed it are Stephen’s experiences and insights which challenge our usual practice and shows that we can do differently and better - and from which we can all benefit. This is why I asked Stephen to expand his story in this post. Stephen’s story is important to share, both to encourage diversity in our profession but also to make all of us aware and support those of us who have a harder time then others; this is best illustrated by Nicholas Kristof’s baseball analogy when he wrote about diversity in US society: "I think it’s really hard for people who were born on third base, and whose friends were born on third base, and who assume kind of a third-base context, it’s really hard to understand the enormous obstacles that face those who in early life encountered a much less rosy environment. It’s so easy to hit a home run from third base and say "boy, this is pretty easy, why can’t everyone else do this?" I was honoured to be recognised by the RIBA as a role model and to be given this opportunity to write briefly about some of the extraordinary experiences that I have had in pursuit of a career in architecture. The route has been longer and far more difficult than I could ever have imagined, but there is also a positive message about what I have contributed to the profession that I hope inspires others to join me. I have had to face and will continue to face many barriers and stumbling blocks, in education, job seeking and in the workplace. Therefore, I am in a position to draw attention to areas and issues that I consider need improving and addressing. I consider the architectural profession needs to tap into the unique talents of deaf people. We all use the same space in buildings and want our communities to thrive and everyone can gain from their inclusion, this would really unite the deaf and hearing cultures. Nicola Hughes, an architect, at the Role Model launch said “that because architecture, design and buildings are such visual things then a creative deaf person who has very strong visual perception would surely be a great asset to the profession”. This was very refreshing to hear because I possess this ‘extra’ sense, great spatial awareness and a fast-responding brain – skills we develop to make up for our lack of hearing and skills that are a great asset to the profession. Studying architecture is demanding for anyone – but more challenging for deaf students due to the literacy challenges. For example, the reading of books and material when studying, such as for a thesis, tended to take much longer for me than a hearing person because I had never come across many of the architectural words and phrases before and a great number of these did not have a specific sign. Therefore during the course, my interpreter and I had to set up our own ‘dictionary’ of signs, or use finger spelling which was very time consuming. This worked well when I had one or two interpreters, but in one year I had 17 so they had no idea what to do with all these ‘strange’ words they had to interpret. To give you some idea of what this means: I have to learn the meaning of a word and remember it in the context in which it is used and to record each new word, ready to use it again. Likewise with the signs. (Sign Supported English (SSE) is often used with British Sign Language (BSL) to assist with grammatical translation.) This becomes an extra level of education within education and it is mind boggling to say the least because of all the extra work involved. Hearing students can discuss their ideas and problems easily whereas deaf people cannot overhear conversations to get clues and recall what is said and to question and learn in this way. Therefore I would strongly advise any deaf student to fully understand the contents of the course and the support available. For example, I discovered that it can be very hit and miss when trying to access the relevant information on some university websites. Choosing the right studio is essential and ideally if the tutors and students receive deaf awareness training, this would promote better understanding, more integration and creativity when everyone is working together. I needed to borrow library books for longer periods of time than a hearing student would but this was not really possible because so many other students wanted to use the same books. Sometimes I photocopied the most difficult sections of the books or I would buy my own. I could have gained from more sessions with an English teacher and some improvisation of the difficult areas of study e.g. for the theory essay but there never seemed to be enough time for this. I consider that there should be more liaison between those from the schools for the deaf and colleges and universities in order to prepare a profoundly deaf student for further education. Although I started off well, this would have helped my confidence later on. If areas of study that were certain to cause the most problems had been fully assessed earlier on and dealt with in a constructive way, then I would not have been stretched to the limit. There was an enormous amount of pressure and stress when I tried to cope with deadlines and problems. If you do not know anyone like yourself who has done it before, then you have to learn as you go along which I did. It is time now to put things right for all those embarking on a career who have a disability, such as deafness. 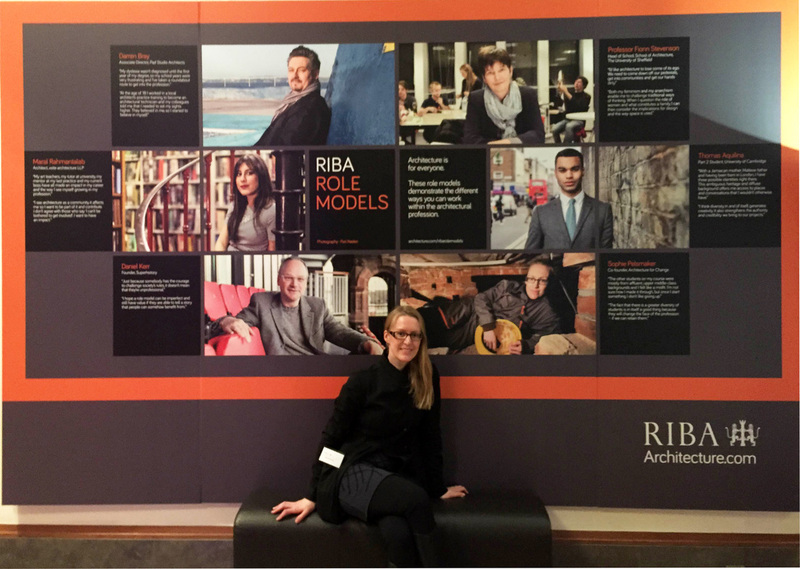 The RIBA role models project is an excellent way to bring about more awareness and to increase diversity and inclusion. I also believe that there is a need to review the study period for certain courses and to extend it for those who need more time, also for some practical experience to be introduced earlier on, so that students can visit sites and learn about the fabric of real buildings – in fact, won't all students benefit from this? I have to acknowledge that some of the more negative situations which arose during my studies, also additional problems of a practical nature, may not now be experienced by deaf students. The schools of architecture and Disability Support Services will know what the current and most frequent problems are. If a ‘review’ web-site could be set up for each, for all to access, then the feedback would be instant about performance levels. One of the most challenging and stressful situations was the lack of promised support from the Disability Support Services - it appeared they had never worked with a profoundly deaf student before and budget issues meant that I had 17 different interpreters in one year. This situation had a negative impact on my studies. I felt like giving up but decided to stick it out. Understanding fully about what is required from Disability Support Services and if they can deliver it will help a deaf student to choose the right course and university. Eventually I had to arrange the booking of the interpreters and note takers myself, that way at least I knew they had been booked. I had a good support agency who gave me continuity. I also had to organise my own note-takers, but they did not always turn up; at least some of the other students would let me read their notes. Other times I had to wait several days to receive the lecture notes (sometimes illegible), though one note-taker was excellent and typed up the notes. But because of all these problems it felt that I never seemed to have the right things at the right time but I succeeded by being super-organised and becoming a swift, strategic thinker and developing new coping strategies – skills beyond what most hearing students developed. But the continuous pressure and mental stimulation meant that I never stopped concentrating and it was exhausting impacting on my health and I had to take advantage of one of the dispensations available. My organisation skills also influenced others’ working practices for the better: the tutors said that I had ‘trained’ them to be more organised because of the way I needed to manage my timetable. For example my tutors needed to keep to presentation times as much as possible because I had interpreters booked for these. If these were changed and I had no interpreter then I was excluded from the discussion and unable to contribute fully without support. It was also frustrating as the interpreter’s fees still had to be paid, reducing the amount left in the budget. Other practical problems included the installation of flashing alarms instead of typical sound alarms (for smoke / fire detectors, doorbells and carbon monoxide fumes) in my student accommodation on the 18th floor of a tower block with amazing views of the London skyline but I had little peace of mind. The whole building had to be evacuated (using the only staircase) because of someone smoking or burning their toast. (My ‘minder’ alerted me every time there was an evacuation.) But the worst incident was when I was prevented from returning to my room, because someone had pulled off the smoke detector on the 12th floor. This vandalism happened on a Sunday close to midnight and the specialist was unable to attend the premises to reset the controls. Eventually instructions were given over the phone to a member of the support team around 5am. This meant I was at greater risk and I had to sleep on the sofa in reception! Those experiences lead me to suggest that the appropriate flashing alarms be provided in all public buildings and this is good for all of us: in reality not all deaf people are born deaf but many become deafened because of illness or accident. Considering architects strive to design buildings to such high specifications surely this is an omission that should be addressed? In fact, because these flashing lights are not fitted in most workplaces, I am not permitted to work alone. With all the time spent on trying to resolve all these problems and overcoming the barriers, it left little time for me to have much social interaction with the other students, which is a large part of a student’s life. The only time I could relax and enjoy myself with them was when we went away as a group on field study trips abroad and I am glad to say my deafness did not prevent me from making some good friends whom I am still in touch with. When I became unemployed my career was put on hold and I had no funding for interpreters – though fortunately my mother was available to help me with communication for a freelance project I landed during this period. I needed sound careers advice and mentorship and networked everyone I knew but without much success. Admittedly, there was a point I felt abandoned by the profession that I had worked so hard to become part of, and that is why I would like to see a comprehensive range of support services provided by the schools of architecture and the RIBA. Website information should be available and more drop in centres should be set up to give a desperately keen person the chance to make contact with someone who will give them help and training to allow them to become more employable. It can be a very hit and miss process trying to establish yourself anywhere after leaving university. I feel that a database could be set up for each student leaving university and this could be updated by the student about their progress, such as employment status and any new skills they have acquired. When practices require new staff they can access this database, see the relevant skills of the unemployed person, C.V. and their present status etc. and contact them for an interview. The RIBA will then have a record of how many students find work easily, from which university and if there is a common factor among those who are long term unemployed etc. During my search for full time employment I came across one of the greatest stumbling blocks which I shall call ‘constructive discrimination.’ One particular response was quite a blatant example: I was contacted and asked to go for an interview because they had really liked the work shown in my CV and wanted to see me immediately. But when I explained that I would need to book an interpreter because of my deafness and requested a different date for the interview, I never received a response until my parents phoned them and they were told “sorry the position has been filled”. Coincidence? I do not think so – especially as I have more stories like this. This led me to ask myself “am I being judged on my disability and not by my ability and do my qualifications count for nothing”? It would be interesting to see what the staff breakdown is in those practices who proudly proclaim that “they are an equal opportunity practice”. I could have exactly the same qualifications as a hearing student but if a practice is not prepared to accommodate the specific way I communicate and operate within their practice, then they will disregard my application. ‘Time is money’ and they are probably concerned about the effect that I would have on their already hectic schedule. That should not mean that I am not capable of maintaining my position in their practice. To make it an equal playing field, someone in their office could easily contact one of my past employers about their experiences with employing a deaf person. This would put them in the picture – and so does my RIBA Role Model story. I am now curious about how I will be perceived in the future when applying for positions because of bringing out the strengths of a deaf person in the architecture profession as an RIBA Role Model. I have missed out on opportunities to work abroad because I just could not get any bursary or funding from anyone for a BSL interpreter. (My family is not wealthy but have helped to support me financially throughout my studies and unemployment). This was extremely disappointing because I was keen to get experience involving Dutch architecture. Also I could not take up an offer from a practice to work on a project in the Middle East for the same reason. This was a stumbling block that I have had to face and I believe it prevented me from developing my skills on projects in the areas of architecture that inspired me. This work would have given me some much needed kudos for job applications. Modern technology has helped me a lot with communication: if someone has an IPad then they can talk into it and what they are saying appears on the screen. Ordinary notes allow me to communicate instantly when I do not have an interpreter. However nothing can beat a one to one conversation and I feel that when a deaf person is employed in a practice then it would help that person if (a) Deaf Awareness Training was given to all staff members and (b) some of the staff learnt at least a few signs. During a group discussion at our table at the Role Models launch Martin Glover, a deaf architect, spoke passionately and at length about the difficulties he experienced when trying to maintain his position as part of a team. A lot of the time he felt excluded when people talk over one another. I gave an impromptu speech at the RIBA Role Model launch to draw attention to how it can be very frustrating that while modern technology means deaf people can be more included in work, that relying on email response can jeopardise meeting deadlines: when we do not receive replies to e-mails, we cannot follow up with a phone call, like hearing people can, unless a colleague or interpreter can ring them instead. As a deaf employee, at times I can feel isolated, with little opportunity for people to get to know me and how sociable I can be. I hope that my participation in the RIBA Role Model project will help in some way to make people more aware of the challenges I faced but also the positive contributions people like me have made to the profession and that this will bring about important changes. I also hope my story will dispel the stigma associated with deafness, whereby people are considered as if we are lesser beings and as if we are not equal to those who can hear. We should be welcomed into the profession for our special skills and creativity. Having had to work doubly hard to get good qualifications and against all the odds to pursue a career in architecture, our skills and abilities that come from such perseverance and dedication are clearly an asset to the profession. The RIBA also has three very useful documents aimed at those with disabilities entering or progressing in architecture, drawing - among others – also on Stephen’s story. You can find these ‘Accessing Architecture’ documents here and also the Design Council’s Inclusive Environments here. Benefits of hearing people to communicate without sound and here. The Royal Institute of British Architects has launched its Equality, Diversity & Inclusion campaign in architecture and named me as one of their Role Models. This campaign highlights the need for architecture to be an inclusive profession and features my personal story about how I forged my career in architecture and the barriers I encountered. You can read about it here and here; other inspirational role models' stories feature here. Image above taken by Stephen Ware, an inspirational RIBA Role Model. When interviewed recently by the Bartlett on gender equality in the built environment, I had to concede that working as a female architecture student and practitioner had not been entirely without obstacles. And I am not alone; according to the AJ's Women in Architecture Survey, the majority of female architects have suffered some form of discrimination during their career. Admittedly, since I was an undergraduate and year-out student in the mid to late 1990's, I have witnessed some encouraging changes in the industry. The past 15-20 years has brought about a positive evolution in common attitudes and gender stereotypes, but there is still some way to go. While women are no longer inherently assigned to more 'suitable' roles such as interior design, or considered incapable of dealing with construction-related work, somehow there still remains a certain scepticism about the ability of female professionals to handle complex situations in the built environment. Attitudes towards women on construction sites have improved; there is no longer a tolerance for the widespread sexual harassment I experienced, but certain prejudices still remain. Today, female architects need only endure the more innocent – but still unprofessional – consternation from the predominantly male construction workers when they arrive on site. And of course, the dodgy, naked calendars in the site office still remain common fixtures. At frequently all-male design team meetings, it can be frustrating and disheartening when your presence is assumed to be in a support or administrative capacity. Especially when starting out on a new project, such preconceptions can create a small, but perceivable barrier, inhibiting women from speaking out or feeling accepted as a fully merited member of the team. It is only once they have proven themselves professionally, shown that they can hold their own and are deserving of the role, that the raised eyebrows disappear. As a female working in this field, I have seen that through our work and abilities we can prove that stereotypes and preconceptions of women in practice are not only out-dated, but senseless. However, it is difficult to influence the culture from within just on our own and, if disillusioned, it may be why women exit the profession altogether. On the positive side, being a woman in the construction industry is not always undermining and on occasions, gender stereotypes can actually work to our advantage. Whether or not it is true, women are considered strong communicators and good collaborative team-workers. In my speciality, sustainable design, this is particularly relevant as it is a field that requires a high level of integrated, collaborative work, and a research-lead and multi-disciplinary approach. Rather than the traditional top-down method, this collaborative way of working suits me well and I have found colleagues highly responsive to my input. Stereotypes aside, women represent around 50% of the world’s population, and so we are undeniably equal stakeholders. It is therefore important that women are encouraged to make their voices heard and be active participants in decision-making. The under-representation of females in built environment professions must be reduced, to prevent the disempowerment and alienation of a large proportion of the population. Simultaneously, the diversity and insights offered by a more varied decision-making team can be beneficially employed to generate new ideas and innovative ways of thinking or working, providing the best solutions for everyone. Aside from the fact that only ~20% of registered architects in the UK are currently female, we also need more women professors, directors, policy-makers, researchers, construction workers, engineers, planners, commissioning clients, and heads of companies. The list is endless – and there is a particularly noticeable lack of female representation at higher levels. It is also clear that the need for greater equality in the built environment is not just limited to gender, but extends to a wide range of socio-economic and cultural groups currently lacking in the industry. As I said, I am not dismissing the fact that significant changes have already been made in recent years, but more needs to be done within the architectural community to make the industry all-inclusive and more accurately representative of the world it operates in. The academic world seems to have moved at a faster pace. Overall, there appears to be a more equal representation of women in the student body and staff, and my experience at UCL in particular suggests that gender is simply less of an issue within this field. Nevertheless, when considering the merits of the academic sphere today, we should not forget that women only have the right to further education thanks to those who fought for equality in the late 19th century and overcame significant societal resistance. The realities of how far society has come in this field simply reveal the future possibilities for the built environment industry at large. In particular, I'd like to make a call to the practices out there at the forefront of sustainable design, which I believe should be leading on equality and diversity. After all, in the creation of long-lasting, environmentally responsive buildings, context always matters. Not only environmental context, but also historic and cultural context. We would never design three buildings, one in London, Hong Kong and Timbuktu, which were all built the same, performed the same and looked the same. Yet, this rich cultural diversity is usually not reflected in the practice make-up. Regardless of the context, we have many of the same kind of faces designing and constructing our buildings worldwide, failing to take advantage of the knowledge and skills a more varied team could offer. This is slowly changing, and the involvement of sustainable design practices such as ECD and EPR in mentoring programs like the RIBA/CIC's Fluid Mentoring Scheme are a promising start. Following a hugely successful inaugural year, I am delighted to take part in such a worthwhile initiative and see it extended in 2013. Furthermore, there are many other ways in which changes can be supported and encouraged. We need a more diverse leadership in architectural education and practice, to reflect the background of the students, the young architects and moreover, the world in which we live. Secondly, women still earn less than their male peers – so fair treatment and equal pay are paramount (and a legal obligation). And finally, industry campaigns, such as those celebrating the achievements of females in a male-dominated environment, might seem a less efficacious approach, but the effects are highly beneficial. For they not only help raise the profile of the nominated women, but communicate a message to industry – and to all young, upcoming professionals in the field – that women can not only choose to do this job, but more importantly, they can do it well. Interested in being involved? Contact RIBA/CIC Fluid Mentoring scheme here. And please respond to the RIBA/CIC diversity survey.